New for 2008 and played over the weekend of 9/10th August, this was the first CA tournament at Bath to be played under Advanced Rules. The handicap range for the tournament was 2 to 8 which is generally known as ‘B Class’. Club President Bob Whitaker and his wife Audrey Whitaker very kindly donated a beautiful cup for the occasion and so the tournament was named the President’s Cup. 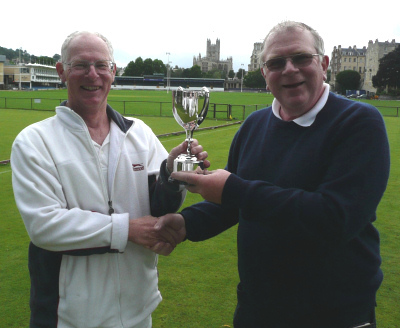 Bath’s Nigel Amos hot from winning the previous week’s Longman Cup at Budleigh Salterton lost no time in also winning the first President’s Cup. Throughout the weekend he played with confidence, maturity and skill. Amos defeated his closest rival Geoff Hughes of Nailsea and ended the tournment as the convincing winner with 6 wins out of 6. Club Chairman Roger Hayes managed the event and did an excellent job of keeping all the players busy despite the appallingly wet August weather. In order that a ‘proper’ Swiss competition could be played all the games were reduced to 22 points thus ensuring everyone managed 3 full games on both days without the need for time limits. This generally worked well and very few games had to have time limits imposed by the manager.